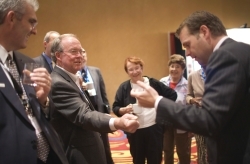 Professional trade show magicians can be powerful catalysts for increasing exhibit traffic and heightening awareness of your company's product or service among conference attendees. Magician Dennis Watkins (right) attracts exhibit visitors with his compelling performance. To support your exhibiting sales objectives, these highly trained event professionals spend significant time before a show learning about your company, market positioning, products and essential selling points. They script their shows beforehand to ensure your product or service is effectively integrated into the magic act to maximize message impact. As a result, they can serve as a marketing partner in educating exhibit booth attendees about your product or service's key points of distinction. While performing their illusions, magicians make sure your company information is emphasized. A research study by Exhibit Surveys, Inc. reveals that live demonstrations and entertainment in display areas are among the top methods for attracting incremental booth traffic. Additionally, professional tradeshow magicians receive high rankings for product awareness and recognition. In addition to reinforcing your marketing messages, an effective and entertaining magician can attract more visitors to your exhibit and help you secure more sales leads for your post-show follow-up. You can expect to invest anywhere from $2,000 to $5,000+ a day, but the expense may be well worth it when their mix of sales and sleight of hand bring prospective customers to your booth. During the hiring process, don’t look for the lowest fee and assume that any entertainer can work your exhibit. Rather, consider several professionals and compare their experience and skills in the event arena. Then ask for references, YouTube links or a DVD of past performances. You may even request a live "demo" act to help you determine that you are getting value for your marketing investment. For additional ways to track booth visitors, click here trade show ideas or on the links listed below.